The beauty of the morning. From up on Brooklyn Heights’ beloved Promenade, you can see the rebuilt World Trade Center and Manhattan’s mighty skyline. Horrified Heights residents stood on the famed esplanade on Sept. 11, 2001, and watched the Twin Towers burn. Now, as you stand here, the sight of the new Trade Center is both poignant and healing. Closer to the Promenade, meticulously landscaped Brooklyn Bridge Park and the glittering East River please the eye. Here’s the multi-million-dollar view everybody comes to the Promenade to photograph — of the World Trade Center and surrounding Manhattan skyscrapers. To your right, the iconic Brooklyn Bridge stretches across the waters. A Promenade visitor poses for pictures with the Brooklyn Bridge in the background. To your left, Lady Liberty lifts her torch. No wonder the Promenade is a popular selfie-snapping spot for the tourists as well as a gathering place for the locals. The Promenade is threatened, as everyone knows. You should save this story link, so you can look at our photos periodically to remind yourself of what Brooklyn Heights civic groups and residents are fighting to save. From the Promenade you get a bird’s eye view of the sound-attenuating berms at Brooklyn Bridge Park. In recent weeks, the Promenade’s supporters have mobilized to campaign for its continued existence. The city Department of Transportation sent shock waves through the neighborhood in late September by announcing a proposal to tear down the cherished recreation area and replace it with a six-lane bypass for the Brooklyn-Queens Expressway. The transportation agency’s honchos said this was their preferred solution for speeding up planned BQE repairs. From up here on the Promenade, the vegetation on Brooklyn Bridge Park’s Pier 3 has a wintry look. As our colleague Mary Frost has reported, the Brooklyn Heights Association recently presented the Transportation Department with an alternative to the Promenade’s demolition. The concept, as envisioned by Marc Wouters Studios, would entail the construction of a temporary two-level highway at the edge of Brooklyn Bridge Park. Here’s Brooklyn Bridge Park’s Pier 2 play area with its distinctive blue roof, as seen from the Promenade. Because the trees have lost their leaves, you can see the Promenade-facing sides of Columbia Heights rowhouses. Did you know that the Promenade’s anniversary is coming up? It officially opened on Dec. 7, 1951. 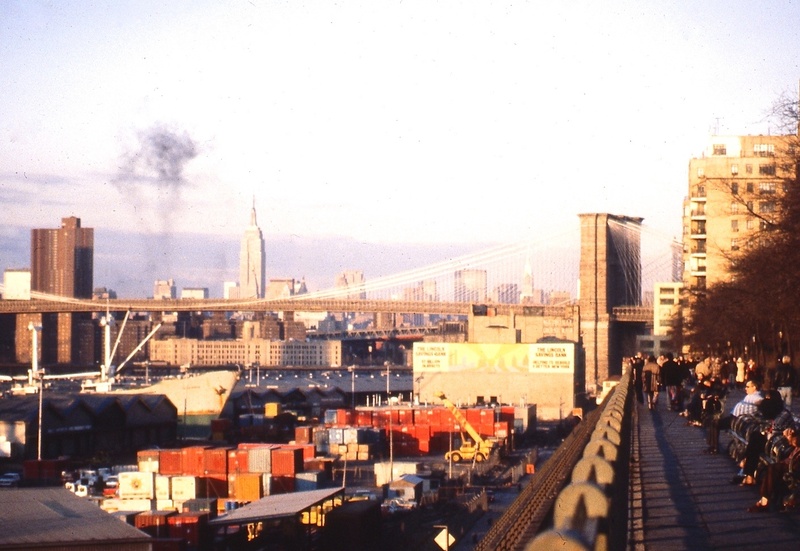 The Promenade came into existence as a top for the BQE, which was built back then. Here’s a blood-chilling historical footnote. According to the late Henrik Krogius, who was the editor of our sister publication, the Brooklyn Heights Press, for 22 years, the extraordinarily powerful Robert Moses wanted the BQE to be built along Hicks Street in Brooklyn Heights. What a mess that would have made of the neighborhood. It’s selfie time on the Promenade. The Pierhouse condo and hotel development looms large down below the Promenade. Tempus fugit. A sundial marks the hours on Brooklyn Heights’ Promenade. The BQE triple cantilever – of which the promenade is a part – is the thing that needs fixing. It makes sense they would shut down the thing they’re fixing while they fix it. The city should not build a highway through the park to save you and your neighbors some inconvenience. If they ant to shut it down to fix it, how will that happen when they build a highway on top of it? Surely it would be easier to fix when the temporary highway is next to, not above, it.